National Governors' Conference during August of 1953. United States President Dwight D. Eisenhower shakes hands with Greater Seattle's Manager Walter Van Camp, shortly after the President arrives in Seattle in August 1, 1953. Jack Gordon (probably Chairman of the Welcome) stands to the left. According to the June, 1953, issue of the "Greater Seattle Newsletter," this was the "most important" national governors' conference in 20 years. 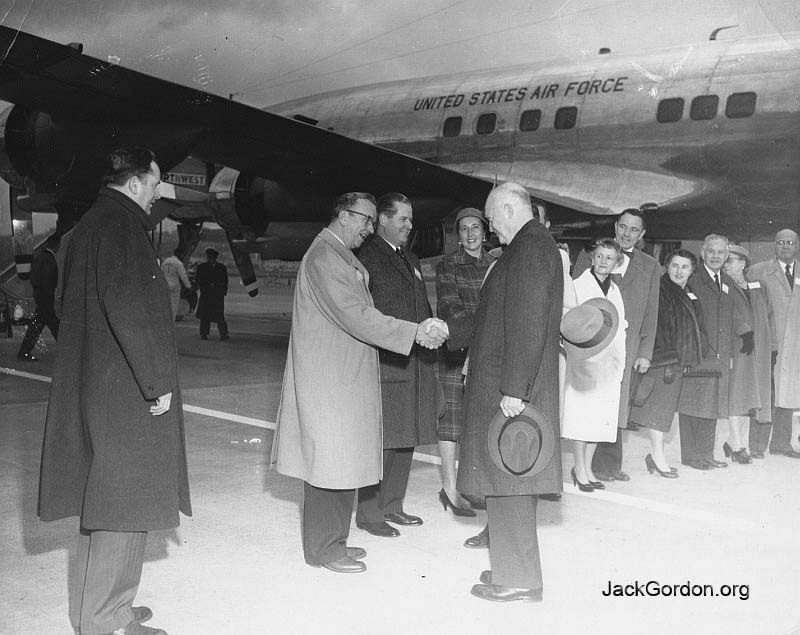 The conference brought governors from all 48 states, and five territories to Seattle to meet with relatively recently elected President Eisenhower. The group was in Seattle from August 2 through August 5. Governor Langlie headed the committee which played host to the President and Governors. This was the first of many Governors' Conferences that Jack was involved with.